Updated at 4:55 p.m. EST. The Breakthrough Energy Coalition, announced yesterday at the opening of the U.N climate conference in Paris, seeks to perform two heavy lifts. One is to use the lure of its contributions — estimated by one member at $2 billion over five years — to pressure the world's richest countries to double their funding for basic energy research. The other is to prod its members to be a source of "patient capital" -- to spurn the rush to cash out that is a signature of modern venture capital, and instead hang on for a decade or more to get their money back. Bill Gates, co-founder of Microsoft Corp. and co-chair of the Bill & Melinda Gates Foundation. Photo courtesy of Twitter. "A key part of the solution is to attract investors who can afford to be patient, and whose goal is as much to accelerate innovation as it is to turn a profit," wrote Bill Gates, Microsoft's co-founder, who cobbled together the group of 28 billionaires over the last three months. The group is notable for its variety, and for the fact that many of its members have previously put little of their personal stake toward clean energy. It includes the founders of Facebook and Amazon, some of the most successful industrialists in India and Africa, a selection of hedge fund managers, and a former California Republican candidate for governor. With the sense of momentum growing at the Paris talks day by day, it is not merely a philanthropic effort. The members are savvy investors, and may see a strong international climate agreement as a tectonic shift that shoves "clean energy" from the sidelines of global investment to a centerpiece. "If I were an investor who had not traditionally invested in this area, I would say now, gosh, this is kind of interesting," said Jules Kortenhorst, CEO of the Rocky Mountain Institute, which counts three coalition members as its funders. "These technologies are not only profitable, but are scaling quickly. They are getting a boost from countries around the world that are commiting themselves to a clean technology future," he added. "I would say this is a good bet." The group was created "incredibly fast" in the last three months, Kortenhorst said. The head billionaire wrangler is Gates, who in June announced he would spend $2 billion of his own money to work on clean energy problems. 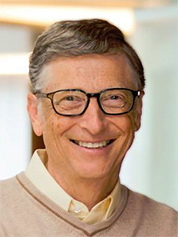 Gates has a history of catalyzing fellow billionaires to invest their money in worthy causes, such as the Giving Pledge, which debuted in 2010 and asked the richest people to commit to giving more than half of their wealth to philanthropy. Several of Monday's signatories have also signed that pledge. 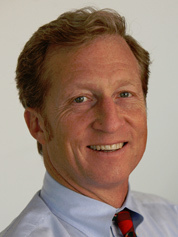 Tom Steyer, former hedge fund manager and founder of NextGen Climate, a San Francisco-based climate advocacy group, and NextGen Climate Action, a political action committee. Photo courtesy of Wikipedia. One member of the new cadre is Tom Steyer, a former hedge fund manager and climate activist whose name is mentioned as a California gubernatorial candidate. He said that Gates' "intellect and probity" were major attractants. "It's a testimony at some level to how seriously people take Bill Gates' leadership. If he thinks this is really important, than I think this is really important, too," is how Steyer described his influence on the group's members. "Still," he added, "you still wouldn't do it if you didn’t think this was a serious issue where being on the right side of history ... wasn’t important to you on some level." Steyer said most of the details of how the group will function haven't yet been figured out, including where and when to meet and how investments will be coordinated. The group won't manage its own fund, Kortenhorst and Steyer said. But another member told EnergyWire that a different option exists for the newcomers to energy investing. Some will invest individually, and others will have the option of donating to a "blind pool" that will be professionally managed by a team being assembled by Gates, said John Arnold, a Texas-based former hedge fund manager who is a group member. The group collectively expects to raise about $2 billion in its first five years, Arnold said. Steyer added that the biggest value the coalition will provide its members is "a coordination of research and information" on clean technologies. The group is using a broad definition of "clean energy" in its search for solutions, including energy generation and storage, energy efficiency, and energy use in transportation, industry and agriculture, according to its principles. Some members of the coalition are names already closely tied to the effort to bring clean technology to market, including venture capitalists John Doerr and Vinod Khosla and Richard Branson, the head of Virgin Group. But the list also features several leaders in the tech industry who have never committed their personal wealth to advancing clean energy, including Mark Zuckerberg, the founder of Facebook; Marc Benioff, the founder and CEO of Salesforce.com; Reid Hoffman, the co-founder of LinkedIn; and Jeff Bezos, the CEO and founder of Amazon.com. It also includes Meg Whitman, the CEO of Hewlett-Packard, who was the Republican candidate for California governor in 2010. "The fact that these strange bedfellows are coming together is not surprising because this problem is a unique problem," said Nancy Floyd, a longtime clean energy investor who is not part of the coalition. "There has to be a new framework to really change the game in climate and energy." The coalition roll call also features former and current hedge fund managers, including Ray Dalio, British investor Chris Hohn and Julian Robertson, who gave heavily to the 2012 presidential campaign of Mitt Romney and to the current campaign of Jeb Bush. One of the most unexpected names is Arnold, a Houston philanthropist who worked as a trader at Enron before going on to make his fortune as a hedge fund manager trading in natural gas. His foundation, the Laura and John Arnold Foundation, invests primarily in education, criminal justice and public policy and has never made a point of investing in clean technology. Arnold said in an interview today that he would invest personally and not through the foundation. The philanthropist said that he didn’t necessarily expect to make a return on his investment in clean energy, a sector whose financial performance he described as "lumpy." "You could have 50 ideas that are funded, and could have 49 zeroes and one that works and changes how energy is generated globally," he said, adding, "I think for me the positive externalities of success are much greater than the financial rewards." Gates also lured George Soros, the investor who has given heavily to causes from political openness in Eastern Europe to an all-out effort to defeat George W. Bush for his second term for president, but who has never made a cause out of clean energy. It is also a heavily international group. Twelve of its 28 members are from outside the United States, including many from the developing world. From Africa, the list includes Aliko Dangote, the Nigerian cement magnate who is Africa's richest man, and Patrice Motsepe, a South African mining baron. From India come the representatives of two of India's largest conglomerates -- Ratan Tata, former chairman of the Tata Group, and Mukesh Ambani, the chairman and managing director of Reliance Industries Ltd. There is also significant representation from China, such as Jack Ma, the founder of Alibaba Group, the e-commerce company that is one of the country's most valuable; the power couple of Zhang Xin and Pan Shiyi, who together run one of China's most successful real estate firms; and venture capitalist Neil Shen. From Japan, a member is Masayoshi Son, the chairman and CEO of SoftBank, and from Saudi Arabia, Al-Waleed bin Talal, a member of the Saudi royal family who is a leading investor and philanthropist. From Europe, members include Hasso Plattner, the co-founder and chairman of SAP, the German software giant, and Xavier Niel, who made his money in French telecommunications and is the founder of one of France's most active venture capital firms. Finally, the group also includes one institutional investor: the University of California, along with its chief investment officer, which oversees the university system's endowment and pension funds. The group is taking direct aim at one of the thorniest problems in clean tech: the yawning time gap between what venture capitalists are willing to fund and the extraordinarily long period it takes for energy technologies to reach the market. Venture capitalists use formulas that expect an "exit" -- usually through either acquisition by a bigger company or an initial public offering -- within three to five years. That formula is an awkward fit with the energy industry, where even promising of technologies take a decade or more to go from frisky startup to the mass market. This fundamental disconnect is one of the main reasons that the two prior waves of clean-tech investment, in the mid-2000s and in 2008 and 2009, resulted in general disappointment rather than market success. "In the current business environment, the risk-reward balance for early-stage investing in potentially transformative energy systems is unlikely to meet the market tests of traditional angel or VC investors -- not until the underlying economics of the energy sector shift further towards clean energy," the coalition said in a paper. "This collective failure can be addressed, in part, by a dramatically scaled-up public research pipeline, linked to a different kind of private investor with a long term commitment to new technologies who is willing to put truly patient flexible risk capital to work. These investors will certainly be motivated partly by the possibility of making big returns over the long-term, but also by the criticality of an energy transition," it said on its website. It is unclear how the moneymen and women who are part of the coalition will be persuaded to be more patient. Meanwhile, the group is also addressing a second problem: Governments have historically been stingy in funding basic research for energy, even as they have demonstrated success in using public dollars to create new industries in pharmaceuticals and information technology. The approach of this billionaire group is to use the power of its members' dollars to force governments to reorder their priorities, by directing their funding to governments that agree to double their investment in clean energy within the next five years. The core of that group also made itself known on Monday and includes 20 countries, including Brazil, Chile, China, Indonesia, France, Germany, Canada and the United States.